Here’s a photo of the wife’s Precip jacket that’s a few years old (4 years?). There’s significant waterproofing failure around the collar. The waterproof backing is starting to back off elsewhere on the jacket as well. 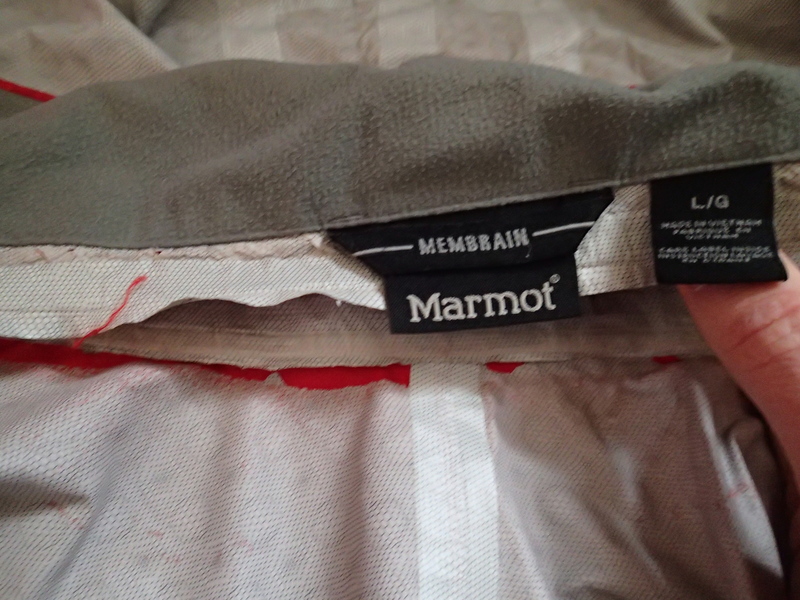 My first Marmot Precip jacket started failing in a similar way, while the exterior jacket would otherwise have plenty of life in it. 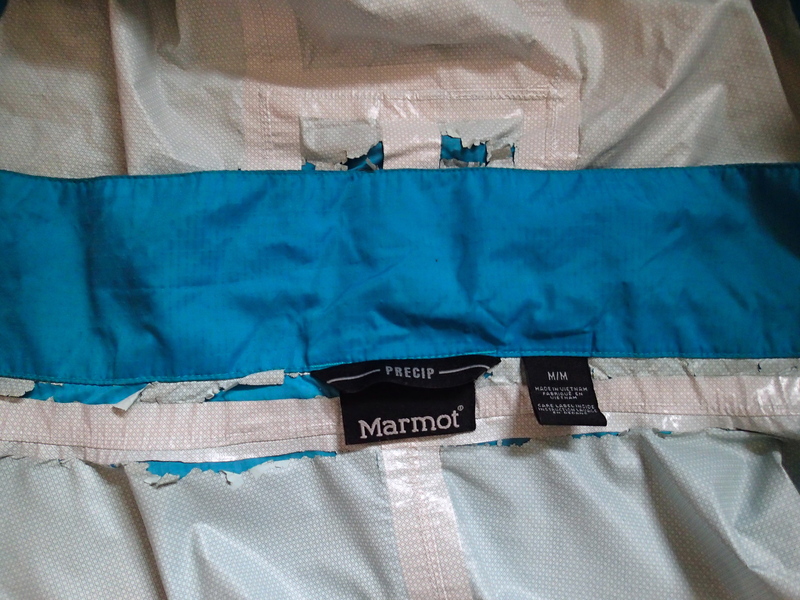 So, I tried stepping up to a jacket with the “Marmot Membrain” material, but after a few years, the waterproofing on it stated to failure in the way around the collar, as you see in the next photo. It’s also started to leak a bit the elbows some at this point as well. This jacket is also maybe 4 years old. 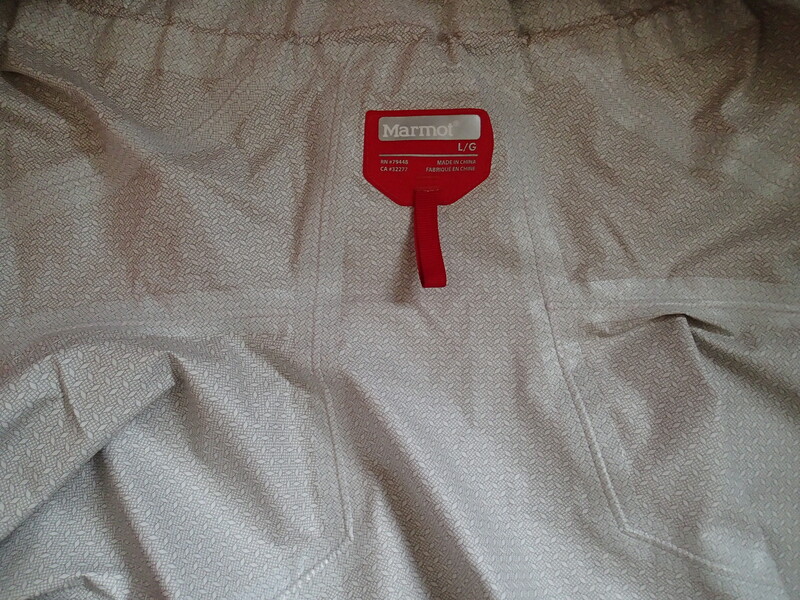 How my Marmot Membrain jacket started to fail. About a year ago I bought my current rain jacket, the “Marmot Artemis”. It uses the “NanoPro Membrain”. So far there are no significant signs of wear. Also notice that it’s a simpler design that removes the failure-prone collar design. No collar seen here, no visible wear. Paying more for a waterproof breathable jacket may be a better value in the end, by providing a product that not only performs better, but is also more durable. It’s just the waterproof/breathable material that determines durability, but also the design. Simpler designs may end up being worth paying more, as the simplicity may contribute to durability. I’m tired of the waterproofing layer wearing out well in advance of the rest of the jacket. If I’m not happy with the durability of NanoPro Membrain, I may try a Gore-Tex jacket next, based on it’s reputation for durability. The added cost up front would be offset by the life of the jacket. I’m also changing my approach to extend the life of these jackets. First, I’m wearing them less frequently when I primarily need a wind-blocking layer. For heavier wind-blocking, I’ll wear my old Marmot Membrain jacket, since the failed waterproofing doesn’t matter for this use. For lighter wind-blocking and light rain I now wear a Patagonia Houdini pullover. At just 3 oz in weight, it’s surprisingly effective as an outer layer for bike commuting. It also packs so small in its own pocket that is easy to bring along in a handlebar bag as a “bail out jacket” if the weather changes.